Trader Joe's isn't quite as adventurous with peanut butter and jelly as they are with say, oh I don't know, MANGO perhaps. But they have done some interesting things with the classic sandwich combination in the past, including Greek yogurt and chocolate bars. 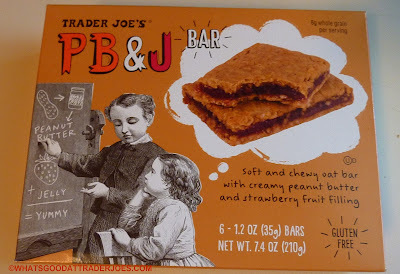 And quite frankly, this is by far the best PB&J product I've tried from TJ's thus far. Plus, it has the added benefit of being gluten free, by virtue of it being made with oats and oat flour instead of typical wheat flour. Unlike the previously-mentioned PB&J chocolate bar, which featured raspberry jelly, TJ's went with strawberry jelly in this particular snack. I'm not sure what they have against good ol' grape, but strawberry has always been my second-place choice for pairing with peanut butter, and it totally works here. The bars flaunt a very nice balance of peanut butteriness and fruity jelly sweetness, although I wouldn't say they taste like peanut butter and jelly sandwiches precisely. I think using wheat flour and grape jelly might have helped push them in that direction. As they stand, there's a definite breakfast bar/cereal bar vibe about them—but I, for one, would certainly not hold that against them. There's plenty of sugar in them, but if you're having them for breakfast like I am, it's easy to justify: you've got all day to burn it off. Plus, there's eight grams of whole grain in each serving and the ingredients look relatively natural and healthy to me, but then again, my English and film degrees didn't require a whole lot of food science courses...so when rambling on about the "healthiness" of various ingredients, I should always put forth the following disclaimer: I have no idea what I'm talking about. But my taste buds don't lie, and furthermore, I have a very sensitive system. And I can confidently state that these bars made me feel happy, energized, and properly-nourished. And yes, they're tasty. Not exactly like a PB&J, but certainly PB&J-inspired. I give these bars four and a half stars. Four from Sonia, who adds that they're not too sweet and not too dry, although she wishes they made a version with almond butter instead of PB. Bottom line: 8.5 out of 10. I like the old fashioned cartoons on the package. Cookie butter & strawberry YUM! Yeah their packaging always has creative artwork. Cookie butter and strawberry? I'd try it I guess. These sound pretty tasty. Going on the list for next visit! Let us know what you think, Paula. Thanks for reading! These are really tasty! 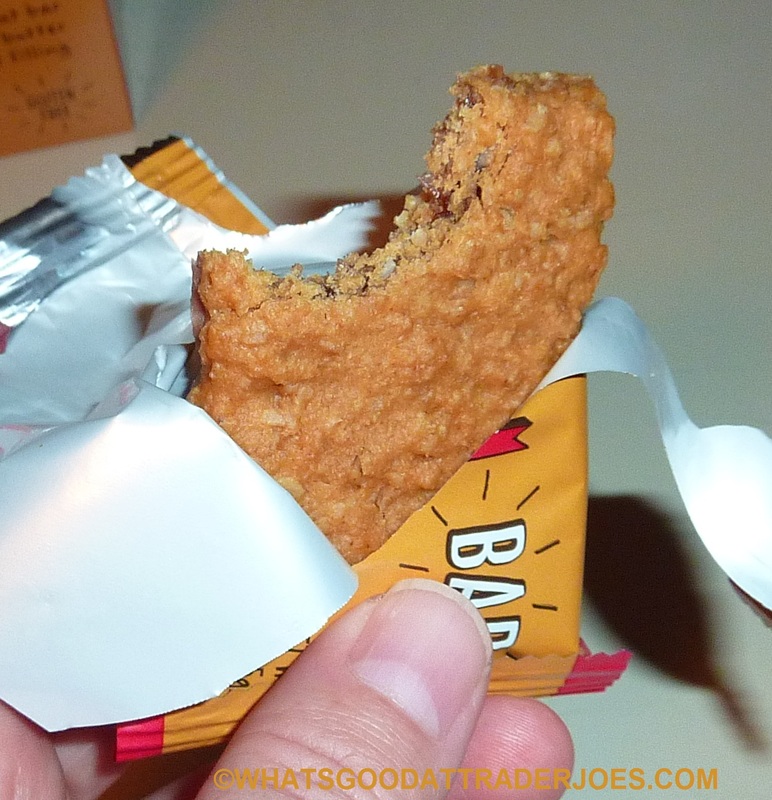 I actually kind of ripped it to chunks and had it in a cup of plain greek yogurt for breakfast which was really delicious and kept me full a good while. I liked these much better than the various fruits walks into a bar versions. I haven't really tried these yet, but bought them to try with my 4 and 1 year olds as another breakfast alternative (and they can be picky). So far they have been an absolute hit! Also, wanted to say thanks for what you do! Always a great read. Do you know if these are limited edition or permanent? I tried them and like the a lot! Thank you. Wow, we just picked them up the other day, and my husband and I agree that they taste terrible. Like metal and sawdust. My son loves these! I literally buy 3 boxes at a time.